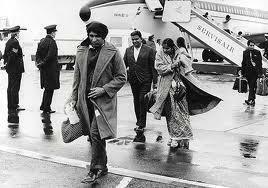 On this day 40 years ago, the first plane of Ugandan Asian refugees landed at Stansted airport following Idi Amin´s chilling announcement on 4th August 1972 giving them 90 days to leave the country as of 8th August. This year, the British Ugandan Asian Community is coming together to commemorate this historic event and to give thanks to the UK for accepting them on their shores. The 40th Anniversary of the Ugandan Expulsion Commemoration - UK Core Committee meets today at Whitehall with Heads of Departments to oversee an events program for the upcoming year, which will have attendees present from several relevant Government Departments and Royal attendance to some of the events. Was it his passionate hatred of Asian success in Uganda, referring to them as "bloodsuckers" draining the economy? Or perhaps a dream from God telling him to free the nation of all Asians? On 4th August, 1972, Idi Amin announced the expulsion of all Asians from Uganda; on that day, the lives of all those living in Uganda changed, some for the better, the majority for the worse. Asians were given 90 days to pack and leave the country, with no more than £50 cash and any belongings they could carry in a suitcase, to start their lives over again. On the airport road, Amin's thuggish soldiers stole jewellery and cash with impunity. One Asian who burnt his cash so that soldiers could not have what he could not take from the country, was shot. An emotional upheaval saw over 28,500 Ugandan Asians deported, leaving their settled and successful lives, businesses, land, shrines, homes and hearts, and arrive in the UK. Others were taken in mainly by Canada, the Scandinavian Countries and the USA as refugees. Some reclaimed their Indian nationality and returned to India. Asians were the middle-class in Uganda, above the working-class black Ugandans who were envious of Asian wealth. Asians felt that they were not given credit for propping up the economy and developing public services. In the years from 1972 to 1985, following the Asian expulsion, Uganda went from being one of the most prosperous countries in Sub-Saharan Africa to the one of the poorest with all the social, health and economic indicators in decline. Diseases that had been eradicated in the 1930s re-appeared, the entire education and health system collapsed and African parents reverted to running their own schools. After Amin's announcement, no country wanted to accept the Asians. India did not want them because it felt those with British passports were the UK's responsibility. Britain was not keen to have them because the Asians were not "kith and kin" of the British people. Enoch Powell, the face of the right wing of British politics, opposed any move to accept the Asians who were encouraged to go to India or any other country so long as it was not Britain. Leicester in the East Midlands was designated a "red" area which the refugees were urged to avoid. The local authority in Leicester took out advertisements in Uganda urging the refugees not to come to Leicester warning them there were no jobs or housing for them. Even elements in the Church of England joined the anti-Asian lobby. However, Ted Heath, then Conservative Prime Minister, ruled that Britain had a moral and legal responsibility to take in Ugandan Asians with British passports. London's dockers and butchers marched in support of Enoch Powell but Heath won the day and the flights starting arriving at Stansted with refugees ill-prepared for a British winter. Temporary settlements were made in 14 camps around England. Vinod Tailor, part of the 40th Anniversary Commemoration Committee, talks about leaving Uganda and landing at Stansted, "I remember hearing my neighbour being shot and his daughter being raped. We were so scared to go outside, but we left in the middle of that night to escape our home. It was cold and damp as soon as we stepped off the plane at Stansted, so different to our lush surroundings in Uganda. We had nothing but the clothes on our back and went to Royal Air Force camps that were temporarily converted as shelter for us, and were fed ham sandwiches even though we were vegetarians. So many people arrived that following week, beds had to be shared." "We came here 25 years ago full of anxiety to an unknown land. The British people extended a welcoming hand enabling us to make this country our home. Very few people tend to say thank you. We intend to be different," remarked the late Manubhai Madhvani in 1997, who left his empire in Uganda. He also had a suggestion about the future, "We should be raising money for British charities, not sending money back to charities in India. We are British and we should not repeat the mistakes of Africa." Forty years on, these Ugandan Asians have been more successful here than anyone else. Broken lives were restored with extraordinary hard work, persistence and determination. The Tory MP Shailesh Vara, whose father migrated from Uganda in the early 1960s, concurs: "Rather than looking at their expulsion as life-destroying, they saw it as a setback. They didn't stay downcast, got up, and started over again." Shops used to shut at 5pm and close on weekends, and 'no wogs' would be written on windows. Now, the Community has transformed consumer expectations and attitudes across Britain. Jatania family (estimated £650m in Rich List). Strong charity support for including charities including Save the Children, the Prince's Trust, the Duke of Edinburgh's Award. Not everyone has made it rich; some found it hard to rebuild their lives, struggling with low paid, labour intensive jobs. But they remain resilient. Why a 40 year anniversary? According to Praful Patel, appointed as the sole Asian member of the UK Government's Uganda Resettlement Board and now a senior member of the 40th Anniversary Commemoration Committee, "I am 73 now, some of those who left Uganda 40 years ago have passed away and in another 10 years many more will pass away. We want to say 'thank you' to Her Majesty's Government and the people of the United Kingdom in this Her Majesty's Diamond Jubilee year for accepting us and we want to celebrate the achievements of those Ugandan Asians that were expelled and have not only done well in business but in all the professions." In 1997, at London's Neasden Temple, Uganda's President Museveni invited Ugandan Asians to return "home", a repeat invitation from the President and the Uganda High Commission. Since then, three hundred Asian families have set up their businesses again in Uganda mostly in its capital city, Kampala. Interviews available with all names mentioned within article upon request, as well as Madhvani family.